This quote is apt for Justice Singhvi. He may not be a great jurist as normally judges are referred to, but surely he is a judge with backbone. In nutshell, he is a judge for ‘AamAdmi’. Justice Singhvi has the longest tenure as a Judge of the High Court to his credit. 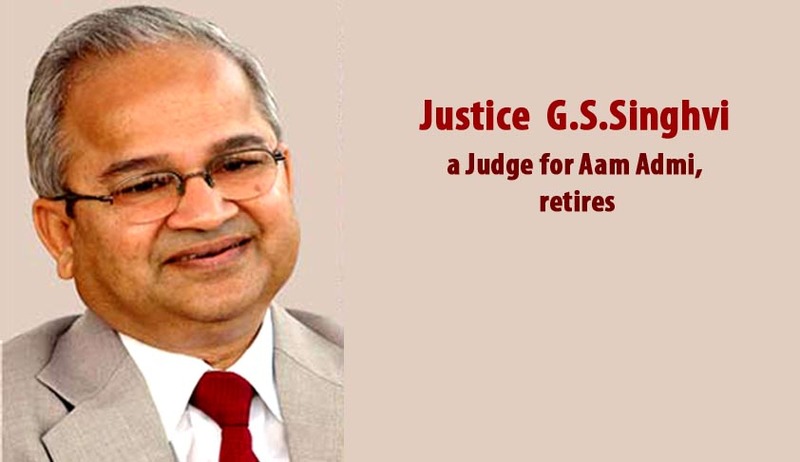 He was elevated to the Bench of Rajasthan High Court on 20.7.1990 and became Supreme Court Judge after 17 years, i.e. on 12.11.2007. Though at present Justice Singhvi is no -2 and junior to the present Chief Justice Sathasivam, he is six years senior to the CJI (as a High Court Judge). Justice Sathasivam was appointed as a permanent Judge of the Madras High Court only on Januray 8, 1996, six years after the appointment of Justice Singhvi. Justice Singhvi, who is due to retire on the 12th of December’ 13, has made a place for himself for his consistent, honest and bold position taken in 2G case, Niira Radia Tape issue, and land acquisition matters.He does not proclaim any established political ideology, but the poor and weakest were always safe in his courts. In his own words, “Litigative exercise is to tire out those who genuinely espouse the cause of the weak and poor"(Quoted from CPIL v. Union of India, popularly known as the 2G scam case). He punished the establishment mercilessly by imposing huge costs for harassing citizens and in all such matters, he directed to recover the cost from the concerned officer who defaulted. The idea was that the public exchequer should not suffer due to its erring members. The judge, who will retire a day before his 65th birthday, was never afraid to take big calls. In a recent hearing, he dismissed the plea of Senior Counsel Rajeev Dhavanin the Radia Tape case, when the lawyer went on to rant against the judge during the proceedings. He reasoned, "If legislature and executive do their job properly, there is no question of judiciary taking cognizance on public centric issues”. Counsels say he will be missed, for being a man who shook the government. He spoke the truth. Comments like “There is zero percent interest if you buy a Mercedes but heavy interest when a farmer buys a tractor” reveals the man behind the Judge. One judgement of Justice Singhvi, which is not well received is Bhullar’s case wherein he did not interfere with death penalty. While confirming death to Bhullar, in another Judgement delivered in the same month, in the case of Mahendra Nath Das, the Bench headed by him commuted death to life. In Bhullar case , delivered on April 12, the Bench comprising Justices G.S. Singhvi and Sudhansu Jyoti Mukhopadhaya, held that the death row convict, Devender Pal Singh Bhullar, is not entitled to commutation of his death sentence, though there was undue, long delay of eight years in disposing of his mercy petition by the President. In MahendraNath Das, which was delivered on May 1, it was held that death sentence could be commuted to life imprisonment because much of the inordinate delay of 12 years in the rejection of his mercy petition by the President . In Bhullar, the Bench headed by Justice Singhvi held that where a person is convicted for terrorism offences, undue long delay in deciding the mercy petition cannot be considered a mitigating factor, which according to the legal community is not correct proposition of Law and contrary to Supreme Court’s five-Judge Constitution Bench’s judgment in Triveniben (1989), which had held that undue long delay in execution of the sentence of death would entitle the convict to approach the Supreme Court under Article 32. Justice Singhvi openly advocated for bonafide Public Interest Litigations (PILs). In one of his rulings he mentioned, “Superior courts will be failing in their constitutional duty if they decline to entertain petitions filed by genuine social groups, NGOs and social workers for espousing the cause of those who are deprived of the basic rights available to every human being, what to say of fundamental rights guaranteed under the Constitution”. For lawyers, he is one of the toughest judges in the Supreme Court. Justice Singhvi, in his mildest words, is extremely sarcastic while commenting on the conduct of lawyers, a critical aspect of his court room behaviour which he displayed religiously throughout his career as a judge. He also stood for quick disposal of cases and refused to grant adjournments for frivolous grounds. Justice Singhvi is thorough with the brief and does not permit any lawyer to take advantage by suppression of facts or law. Had his elevation to the Supreme Court not been delayed, he would have been the Chief Justice of India. For the crony capitalists and corrupt, his retirement is a day for celebration!